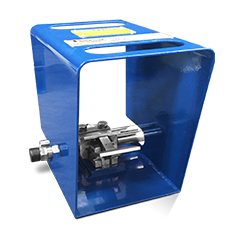 The NLB MGV15-3000 is designed to use a quick-change cartridge seal. This high-quality stainless steel seal (BM23073) makes it possible to quickly rebuild the accessories in the field. This valve is rugged, yet lightweight and easy to use. 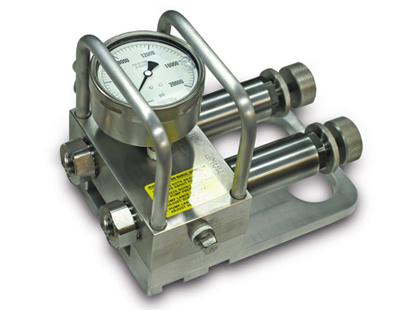 It is rated for pressures up to 15,000 psi (1035 bar) and flows to 60 gpm (228 lpm). There are two spring stacks available for this valve. The standard spring (BM23074) is designed for pressures from 4,000 psi to 12,000 psi (275-830 bar). An optional spring (BM23172) is designed for operating pressure from 8,000 psi to 15,000 psi (552-1035). Requires no tools to set operating pressure. Can be quickly rebuilt in the field by replacing cartridges. Capable of flowing 60 gpm (30 gpm per side). Two sets of springs available to best match specific application. Compact lightweight design weighs only 27 lbs (12.3 kg). Multi-Gun Valves allow multiple lances to work from one pump. 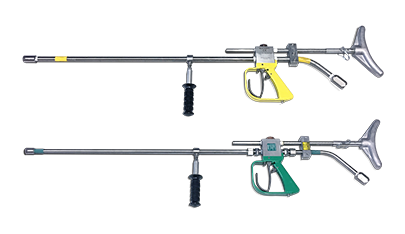 Learn more about sizing nozzles for different work stations with different flows.